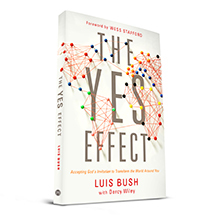 LUIS BUSH travels the world for the sake of the Great Commission. In decades of work with Partners International and AD2000 & Beyond, he and his network of catalysts have mobilized millions of believers to impact the world through devoted prayer and a lifestyle of service. Since 2005, he has served as international facilitator of Transform World Connections, and since 2009, he has championed the 4/14 Window Movement, which seeks to protect, nurture, and empower children worldwide to embrace their inheritance in Christ. DARCY WILEY is a storyteller who digs below the surface to find the transforming work of the Lord in unexpected places. As a youth, she took part in praying for the gateway cities of the 10/40 Window, and then traveled extensively, observing movements of God and serving on mission in various regions of the world. Even as family life has turned her from a world traveler into a stay-at-home mom, God continues to cross her path with the nations through international ministries or casual conversations in the grocery story. Darcy lives in the Indianapolis area with her husband and their three exuberant children. She writes about faith, family, and adventure at darcywiley.com.